In the future, Davis said, all email sent to County Administrative Officer Jeff Benko should be copied to Davis as well. Davis also said that when he or Benko send message to department heads, each also will copy the other. And all correspondence from department heads to state officials also should be copied to both Benko and Davis, according to the directive. 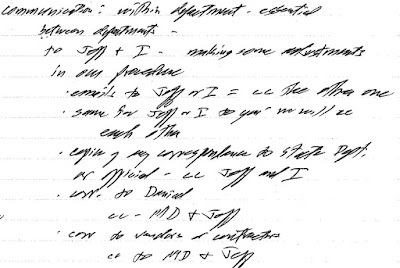 The same should be true for correspondence with County Attorney Daniel Haygood. Davis’ unilaterial directive contradicts the county’s organizational chart, approved as part of an ordinance passed by the Board of Commissioners on Aug. 4, 2009, over Davis’ objection. In that chart, all department heads except one report to Benko, and Benko reports to all five members of the Board of Commissioners equally. The exception is the Finance Department head, who also reports directly to the BOC. Consistent with state law, staff meetings are not publicized, and they are not attended by members of the public. I learned of Davis’ announcement from someone who was not present. I do not how that person, who is not a county employee, learned of what Davis said. I followed up with an open records request for any notes from the meeting taken by Kathy Hayes, administrative assistant to Davis, who attends the meetings on Davis’ behalf, and for an attendance record kept by county Human Resources Director Malinda Smith. Hayes responded that she did not have any notes from the meeting. Smith provided me with the attendance records listing 23 participants in the meeting, including Hayes and Davis. 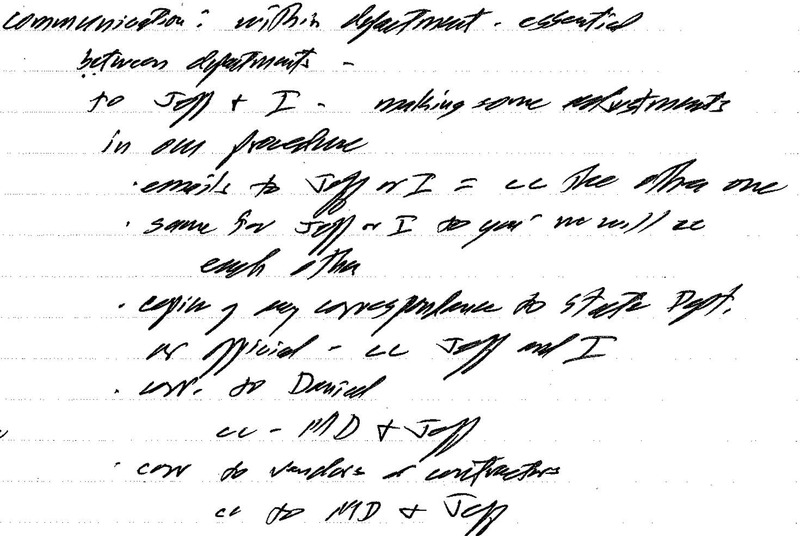 I contacted three of those participants, and each confirmed that Davis had given the instructions that he be copied on email messages in the future. All said that Administrative Officer Benko did not object. Two of them said there was a conversation with Benko after Davis left the meeting about the directive. They did not provide consistent information on the outcome of that conversation. “I work for Benko, not Davis,” one person said, indicating no intention of changing email communication despite what Davis requested. I filed another open records request for any notes Davis might have taken at the meeting. I got back a photocopy (which is here) of a what appears to be a page from a legal sheet, labeled “9/9/15 Staff Meeting” at the top. It mentioned that Commissioner William “Bubber” Wilkes was having surgery on his knee and that Angela Hayes was moving from the Commission office to the Senior Center. It next spelled out the policy of copying all messages to both Benko and Davis and for Davis and Benko to copy each other on messages to the department heads. Davis would not seem to have the authority to require department heads to communicate with him. 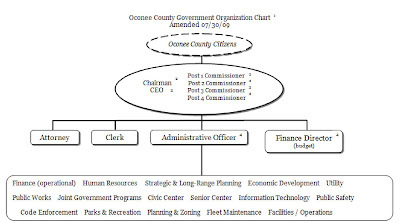 When the Board of Commissioners passed the ordinance in 2009, it spelled out the organization structure for the county and allocated duties among officials. It said the Chairperson of the Board of Commissioners “shall have those rights, duties and responsibilities” set out in the county’s enabling legislation, which is the state law setting up Oconee County’s form of government. In Georgia, each county has its own enabling legislation. The 2009 ordinance also said the “Chairperson shall have particular leadership and emphasis” for coordination of intergovernmental activities, economic development, public relations, and development of policies and positions related to the future needs of the county. 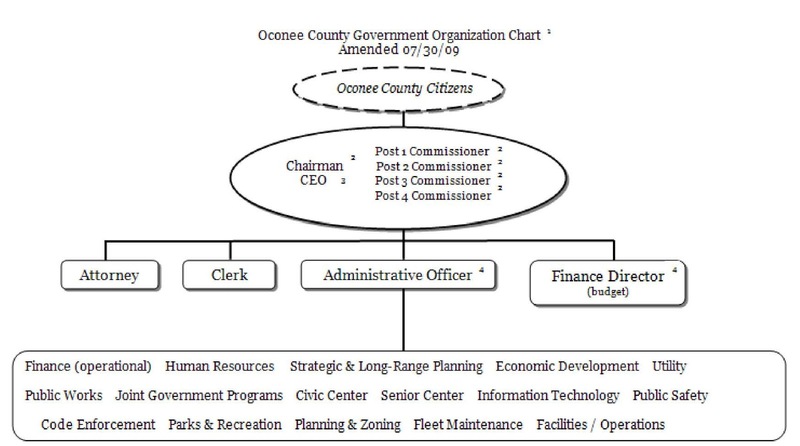 The ordinance also includes an organizational chart (which is here). That chart replaced the chart in place at the time the ordinance was passed. That earlier chart (which is here) had all of the department heads reporting to the chairperson of the Board of Commissioners. The four members of the Commission at that time–John Daniell, Margaret Hale, Chuck Horton, and Jim Luke–consulted with experts at the Carl Vinson Institute of Government at the University of Georgia in shaping the ordinance. County Attorney Daniel Haygood drafted the document. Haygood said that the ordinance was not in conflict with the enabling legislation, which also spells out the “duties and responsibilities” of the chairperson. The four commissioners could have decided to take steps to change the enabling legislation but opted not to do so. That enabling legislation (which is here) says the chairperson is the chief executive officer of the county but does not define what chief executive officer means. One department head I talked to told me that Davis never accepted the restraints placed on him by the 2009 ordinance and has worked since that time to regain his power. Of the commissioners who passed the 2009 ordinance, only Luke and Daniell remain. Horton gave up his seat to challenge Davis unsuccessfully in 2012, and Wilkes defeated Hale in 2014 on a pledge of restoring the power of the Commission chairman. Benko has not worked with the existing Commission to secure his power as a counter balance against Davis. Benko is the top paid administrator in the county, making $106,847 in this fiscal year. Davis is paid $101,064 at present but will be paid $103,095, effective on Jan. 1 of 2016. Davis’ assertion of power is at the cornerstone of a complaint citizen Sarah Bell has made against Davis under the county’s BOC ethics code. The County Organizational Policy is the document passed by the BOC in 2009 that puts the county administrative officer (Benko) is charge of the work of the departments of the county. "Father" Melvin at work again. And his "children" better mind him, too. And this from the guy who originally ran saying that if elected, the chairmanship would become part-time. If the Board of Commissioners lets him get away with such as this, who else has a chance of stopping him??? He also said he would serve only one term because entrenched people wield too much power. Maybe the ethics thing can reign him in. Well, this is about the most disgusting thing I've ever read about Oconee. This is a pure and simple power grab. I'd expect this out of Atlanta under Bill Campbell, DeKalb County, Fulton County, but not Oconee. Lee Becker has pointed out before: There is nowhere in the county bylaws that allows for a full-time county commission chair, let alone one who makes well over six figures! I pray this is the beginning of the end of the Melvin Davis/Jeff Benko/Jamie Boswell/Rick Waller/Frank Bishop power cabal. Oconeeians, please start paying attention; we deserve much better, but it's on us to vote in ethical, professional, transparent elected officials.